Nottingham Forest kept their Championship play-off hopes alive with a win over struggling Birmingham. 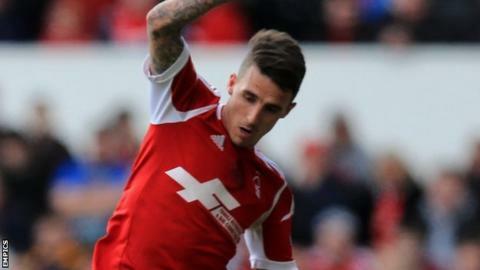 Matt Derbyshire was played through by Jamie Paterson in the second minute and fired in to put the home side ahead. Forest dominated the first half but failed to add a second as Ben Osborn and David Vaughan shot wide. Forest's win over Birmingham gave them their first league win since beating Huddersfield on 11 February. The home side were almost punished but a Chris Burke shot was deflected wide and keeper Karl Darlow saved a Paul Robinson header as Forest held on. The victory ended a run of 12 league games without a win for temporary manager Gary Brazil and moved his side to within three points of the top six. Forest's remaining three games see them visit Leeds and Bournemouth before a home game against Brighton. For Birmingham, defeat means they lie just a point above the bottom three, although they have a game in hand on most of their rivals. The visitors could have little complaint at the defeat by Forest, who took an early lead when Derbyshire slotted past advancing keeper Darren Randolph. Forest had plenty of chances to extend their advantage but failed to do so as Osborn headed over and sent a shot wide, while Derbyshire and Vaughan also sent strikes narrowly off target. Birmingham improved after the break and Burke crossed for Nikola Zigic only for the striker to head straight at Darlow. Burke thought he had equalised when he flashed a shot across goal before a deflection took his effort wide. From the resulting corner, Darlow excellently turned a Robinson header around the post as Forest won their first league game since 11 February. Nottingham Forest caretaker boss Gary Brazil: "I said weeks ago that it might not take a massive number of points to get you into sixth place and it is proving to be the case. "I am really pleased for everyone at the club because this has been a tough period. To get ourselves a win now gives us some momentum, but we have to carry that on now, on Monday afternoon." Birmingham manager Lee Clark: "We have to dust ourselves down following this, because we have some huge games coming up. "We have to go again. We need our senior players to step up to the plate. "It is in our own hands and we have to look after ourselves. We have to produce the goods. We grasped things better in the second half, but we need to do it for entire games." Match ends, Nottingham Forest 1, Birmingham City 0. Second Half ends, Nottingham Forest 1, Birmingham City 0. Attempt missed. Darius Henderson (Nottingham Forest) left footed shot from the centre of the box is close, but misses to the left. Assisted by Lee Peltier with a headed pass. Offside, Nottingham Forest. Simon Cox tries a through ball, but Jamie Paterson is caught offside. Attempt blocked. Jamie Paterson (Nottingham Forest) right footed shot from the left side of the box is blocked. Assisted by Daniel Fox. Jonathan Spector (Birmingham City) wins a free kick in the attacking half. Emyr Huws (Birmingham City) wins a free kick in the attacking half. Offside, Nottingham Forest. Jamie Paterson tries a through ball, but Darius Henderson is caught offside. Attempt blocked. Peter Løvenkrands (Birmingham City) left footed shot from the centre of the box is blocked. Substitution, Nottingham Forest. Simon Cox replaces Jamie Mackie. Hand ball by Chris Burke (Birmingham City). Attempt blocked. Chris Burke (Birmingham City) right footed shot from outside the box is blocked. Corner, Birmingham City. Conceded by Karl Darlow. Attempt saved. Paul Robinson (Birmingham City) header from the right side of the six yard box is saved in the bottom right corner. Assisted by Jordon Ibe with a cross. Corner, Birmingham City. Conceded by Daniel Fox. Offside, Birmingham City. Tom Thorpe tries a through ball, but Federico Macheda is caught offside. Substitution, Nottingham Forest. Darius Henderson replaces Matt Derbyshire. Chris Burke (Birmingham City) wins a free kick in the defensive half. Dangerous play by Jamie Paterson (Nottingham Forest). Peter Løvenkrands (Birmingham City) wins a free kick in the defensive half. Attempt saved. Nikola Zigic (Birmingham City) header from the centre of the box is saved in the centre of the goal. Assisted by Tom Thorpe with a cross. Attempt missed. Jordon Ibe (Birmingham City) right footed shot from outside the box misses to the right. Assisted by Chris Burke. Substitution, Birmingham City. Federico Macheda replaces Mitch Hancox.